Background: The therapeutic strategies to manage neurodegenerative diseases remain limited and it is necessary to discover new agents for their prevention and control. Oxidative stress and inflammation play a main role in the pathogenesis of neurodegenerative diseases. The aim of this study is to review the effects of green tea catechins against the Neurodegenerative Diseases. Methods: In this study, we extensively reviewed all articles on the terms of Green tea, catechins, CNS disorders, and different diseases in PubMed, Science Direct, Scopus, and Google Scholar databases between the years 1990 and 2017. Results: The present study found that catechins, the major flavonoids in green tea, are powerful antioxidants and radical scavengers which possess the potential roles in the management of neurodegenerative diseases. Catechins modulate the cellular and molecular mechanisms through the inflammation-related NF-κB and the nuclear factor erythroid 2-related factor 2 (Nrf2) signaling pathways. 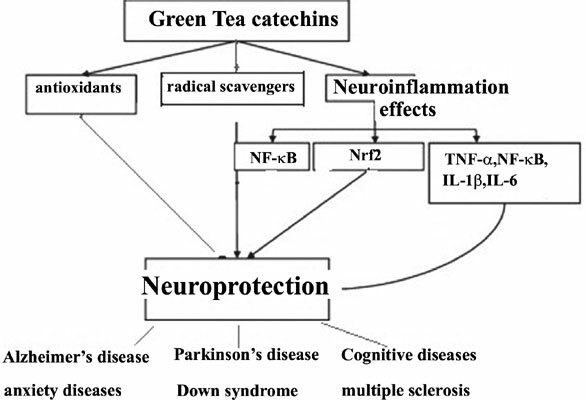 Conclusion: The findings of the present review shows catechins could be effective against neurodegenerative diseases due to their antioxidation and anti-inflammation effects and the involved biochemical pathways including Nrf2 and NF-kB signaling pathways. Neurodegenerative diseases, green tea, catechins, antioxidant, anti-inflammation, therapeutic strategies.